You are WELCOME to come to all, or any part of this long weekend of folk dance, music & song. You're asked just one price to take part in the whole series of daytime workshops. Similarly in the evenings, it's one price - workshop before music start-up, through a whole evening's varied dancing. Please come-in, sign-in & make a fair contribution towards our costs of hall hire. New information - again long after our publicised dates, brought changed circumstances in a 2nd consecutive year. We've again amended to a 2011 Saturday start. Our only practicable alternative with another local dance on Fri Eve. Again - assurances suggest we may in 2012, return to a Fri eve start in the Memorial Hall, as in the initial 27 years. The Family group category is to make the weekend more accessible to finances of 2 adults with several children, and to encourage participation of young people. If 1 adult brings several young people, you may rate these as 1 adult and 1 u16. 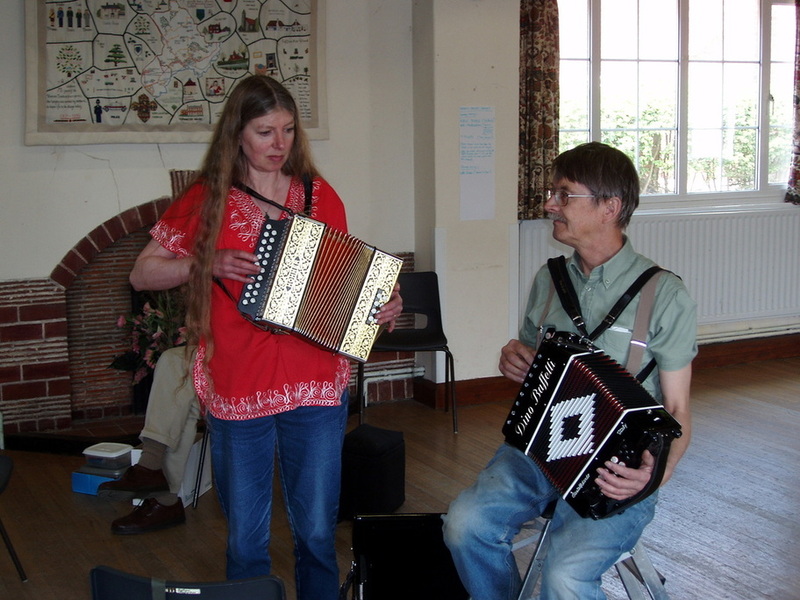 An occasion with the hall otherwise unused, allows an informal chance to make music together.